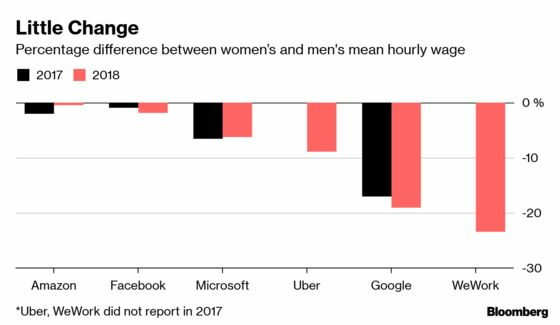 (Bloomberg) -- One year after U.K.-based businesses were forced to report their gender pay gap, there has been some change from tech companies, but not all of it in the right direction. Facebook Inc. is now paying female staff less on average, but has hired more women in senior positions. Amazon.com Inc., which still employs about the same number of men and women in top jobs, has improved the gap in average pay, while Uber Technologies Inc. and WeWork Cos both revealed a sizable pay gaps. In April 2018, employers with 250 or more staff in the U.K. were required for the first time to publish data on their gender pay gaps, including the mean and median difference in average hourly wages, bonuses, and what percentage of each pay quartile goes to women. There were a couple of notable new entries into the report. Uber, which now employs enough people to make its gender pay gap reporting mandatory, revealed it pays women 8.9 percent less than men, and women occupy 32.9 percent of top jobs at the ride-hailing firm. At WeWork International Limited, the U.K. arm of the work-sharing startup, woman were paid 23.4 percent less, and make up 39.4 percent of the top jobs. Dating app maker Badoo, which also operates the female-focused Bumble service, pays women 33 percent less than men, and women occupy 14 percent of top jobs at the company. A spokeswoman for Badoo declined to comment. Microsoft Corp said it now pays women 6.3 percent less than men, compared to 6.6 percent less, but women occupy a slightly lower amount of the highest paid jobs, 22 percent compared to 22.8 percent. Companies have until midnight April 4 to publish their 2018 figures. Ronan Harris, managing director of Google U.K. and Ireland, said in a statement that "while the number of women in engineering and leadership roles is increasing, we have much more to do to close this gap." Figures are not much better outside of the U.K. In the company’s annual diversity report, while Google’s workforce employed fewer white, male employees in 2018 compared with 2017, the figures for people of color showed less obvious improvement. A Microsoft spokesman said "we fully recognise that this is a journey and that it will take many years of investment and leadership to enable lasting change." Tech companies have continued to grapple with deep-rooted issues around discrimination. Around half of all women who responded to a recent survey from London-based venture capital firm Atomico reported experiencing discrimination. VC firms have escaped filing figures, as they have fewer than 250 employees. According to the funds raised by European VC-backed companies in 2018, about 93 percent went to all-male founding teams, the report said. "We have more to do across the board but we are committed to increasing the representation of women at all levels and in all areas of our business," Fiona Mullan, vice president at Facebook, said.